I was sitting outside a family-owned restaurant in the heart of the city. The experience was pretty on par with what I thought it would be: live salsa music, an endless supply of rum cocktails, and animated chatter from locals and tourists, alike. One thing I didn’t expect? Dogs. More stray dogs than I could count. Being a dog lover, I offered some leftover chicken and water to flea-covered pup eyeing us from a few feet away. Dogs have lived alongside humans for over 30,000 years. In that time, many observations have been made regarding the nature of their bond. There’s no doubt that dogs and humans have a unique relationship but can we call it love? Or is it just the cutest instance of a parasitic relationship ever? Recent studies seem to believe the former. Research shows that not only are dogs capable of loving us, but they see us as their family. How did scientists arrive at this conclusion? A little-known chemical called oxytocin. According to Psychology Today, oxytocin “is a powerful hormone that acts as a neurotransmitter in the brain…When we hug or kiss a loved one, oxytocin levels increase.” Oxytocin, also known as ‘the love hormone’, plays a large role in maternal-infant bonding. That is why uninterrupted, skin-to-skin contact following the birth of a child is so crucial. 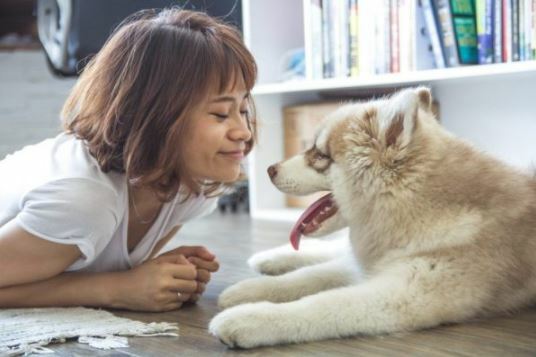 Interestingly enough, it turns out that oxytocin transcends human relationships and also plays a role in the relationship you have with your pup. Recent studies show that when our fur babies stare into our eyes, oxytocin is released, thus bonding us in the same way it would a mother and child. Animal behavioralist Takefumi Kikusui heard of this and immediately took an interest. He performed a lab study on 30 pets, a mixture of dogs and wolves. After having the owners interact with their pets for 30 minutes, the study showed that “both male and female dogs experienced a 130% rise in oxytocin levels, and both male and female owners a 300% increase.” However, there was no increase in oxytocin for wolves which is not surprising given the fact that wolves interpret prolonged eye contact as a threat. In addition to giving us the warm and fuzzies, dogs have a great effect on our physical and mental health. In fact, research shows that people over the age of 60 who lived with just their pet are four times less likely to develop depression as their counterparts without pets. However, that doesn’t mean you have to be elderly to benefit from a pooch. Companion animals are becoming increasingly popular for people of all ages to combat depression and anxiety and promote good mental health. Bottom line: dogs are a gift. Not only are they capable of loving us, but that love can prompt drastic changes that will make us healthier, happier, and more productive. So next time you’re feeling down and out, grab your pup! Whether you take them outside for some playtime or simply hold them close for a cuddlefest, the time spent together will be mutually beneficial. Even if you don’t own a dog, there are plenty of shelters and rescues that could use an extra set of hands. Who knows? You may end up taking home a new best friend. Chelsea Rivera founded SimpleWag with one goal in mind: to help pet owners ensure their pets live the healthiest lives possible! SimpleWag offers its audience access to loads of great content, including expert information provided by staffed vets, trainers, and behavioural specialists. Additionally, SimpleWag offers a pet food alert that notifies you if your pet’s food has been recalled. We do the research so you don’t have to! In addition to working for SimpleWag, Chelsea spends her days getting bossed around by her 5 lb. Maltipoo, Baby, in LA. Follow SimpleWag on Facebook or Instagram @simplewag.